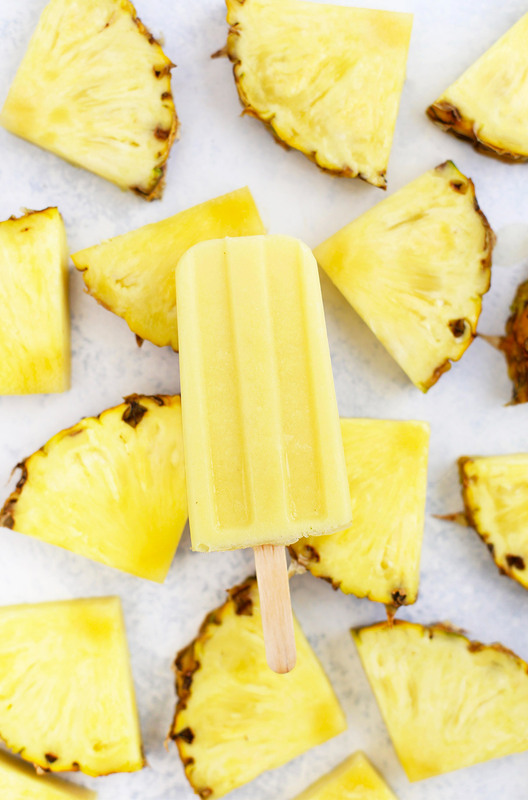 Homemade Dole Whip Popsicles – Your favorite Disneyland Dole Whip turned into a healthy homemade popsicle! This one is naturally sweetened, has 3 ingredients, and is paleo & vegan approved! Can we talk about Disneyland treats for a minute? 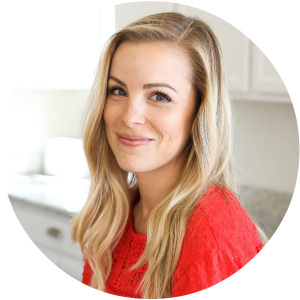 In my pre-gluten free life, I was all about a warm churro and the amazing corn dogs (yeah, I know, corn dogs. But have you TRIED THEM?). I loved the soft Mickey pretzels, and the chocolate dipped bananas, and well, anything I could get my hands on. It wasn’t till our latest trip to Disneyland, however, that I tried my first Dole Whip. (Whaaaat!? I know!) Turns out, they’re totally worthy of their amazing reputation. 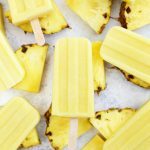 Creamy pineapple soft-serve ice cream that tastes amazing AND is dairy free! You can bet we’ll never again visit without having a Dole Whip. But, in between Disneyland trips, I’ve got exactly the recipe to get my fix: homemade Dole Whip popsicles! 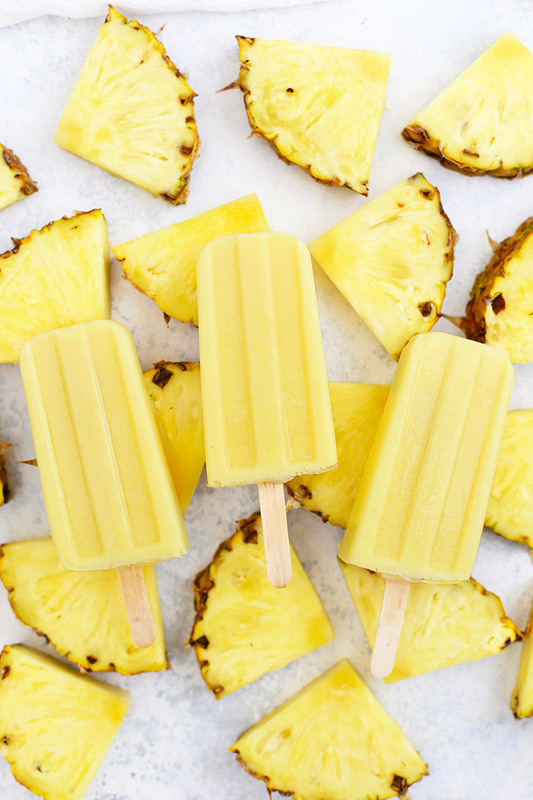 Dole Whip popsicles have an intensely pineapple flavor since the whole recipe is based on pineapple. We get lots of creaminess from just a little coconut milk and a tiny bit of added sweetness from a little honey or maple syrup. Then, all you need is a quick blend and a freeze, you’re in business! My Favorite Popsicle Mold – Every time I post a popsicle recipe, I get asked about my mold. I own many different ones, but this is my favorite popsicle mold. It’s got 10 slots and has a lid that holds the sticks in place while you freeze them (so handy!). Can I Just Make a Dole Whip Instead? Yep! If you’re making “nice cream” or soft-serve, I recommend using a food processor and frozen pineapple over fresh. You can get by using less coconut milk in a food processor with frozen pineapple than you can in a blender, so you’ll get that nice soft-serve texture, rather than it turning into a smoothie. A Tip About Coconut Milk – I highly recommend using canned full-fat coconut milk in this recipe. It’ll give you the best creamy texture and you’re really not using a lot for the whole recipe. If you *must* use a lower fat version, I recommend lite canned coconut milk over the refrigerated/carton stuff. The ready-to-drink/carton coconut milk will be very thin and will give you more ice-y pops rather than a creamy popsicle. PS – Looking for coconut milk without any gums? Natural Value has only coconut + water! 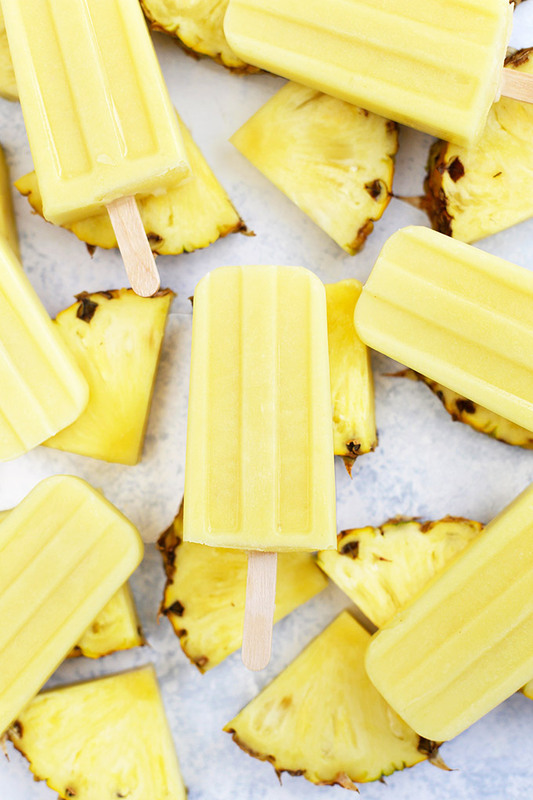 Your favorite Disneyland Dole Whip turned into a healthy homemade popsicle. Don’t miss the directions for making soft-serve style Dole Whips in the notes section! Place pineapple, 1/2 cup coconut milk, and syrup/honey (if using) into your blender. Puree until completely smooth and no lumps remain, adding more coconut milk if necessary to blend. Taste and add additional syrup or honey as needed, blending again to combine. Pour into popsicle mold, insert sticks, and freeze 3-4 hours or until completely firm. To release from popsicle mold, run mold under cool water for a few seconds and use a side-to-side motion to release popsicle from the mold. Store leftover popsicles in an airtight bag or container in the freezer. 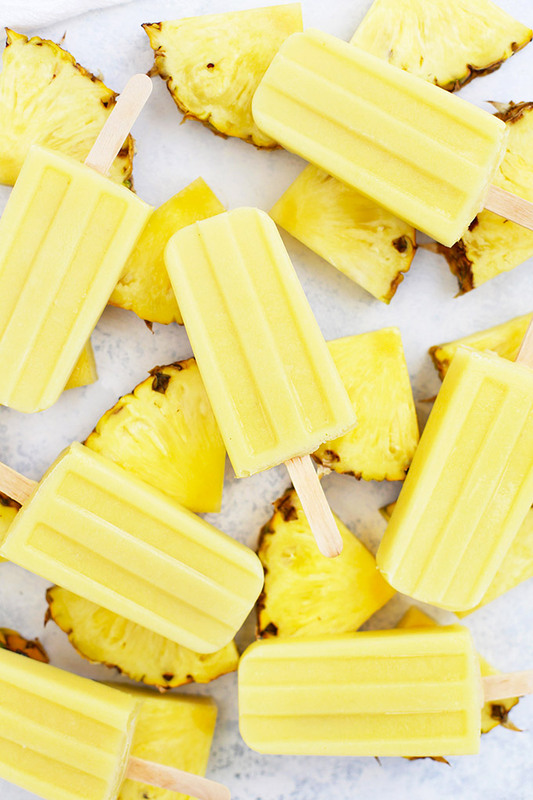 I need these popsicles in my life asap! They look amazing! Thank you Paige! I LOVE them! Thank you for the recipe! Should I attempt to blend the separated cream into the watery part of the coconut milk prior to using it in this recipe, or should I only use the separated cream? Thanks! I usually shake the can to combine the cream/water so i can use both parts. If that’s not an option, I’d grab a little of each when it’s open! Thank you for the recipe! Should I blend the thick cream into the watery part of the coconut milk prior to using, or should I only use the thick cream? Thanks! Wow these popsicles are fantastic!!! So sweet and creamy. My four year old and two year old are loving them, and my 8 month old got to try some of the smoothie base before it froze. All three are in heaven! Oh hooray! It’s always great when something is a hit with EVERYONE in the family!! !